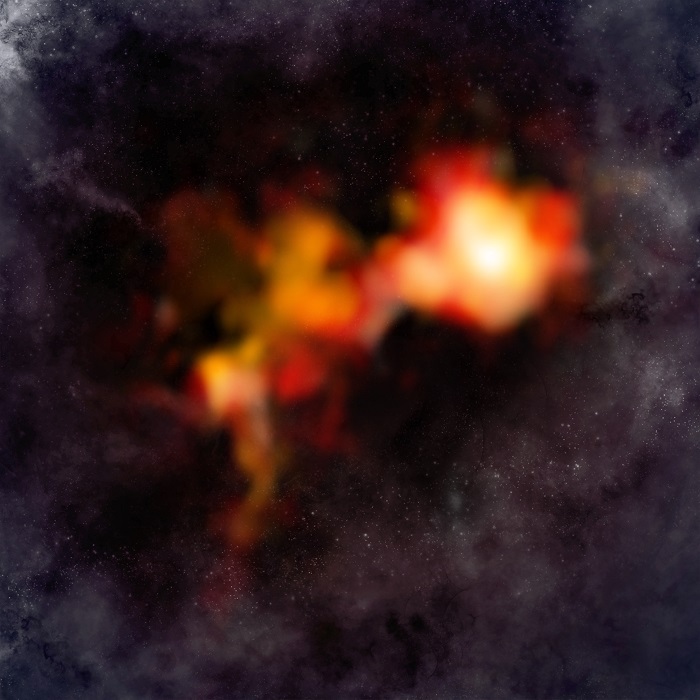 This image shows the ALMA data overlaid on an artist’s impression background. The ALMA data show two main cores as imaged by emission from the molecular ion N2D+ (two nitrogen and one deuterium atom). The core on the right is particularly bright and rounded, suggesting it is self-gravitating and poised to form a massive, single star – a very rare occurrence in star formation. The other core appears more distorted and fragmented, potentially leading to the formation of multiple lower-mass stars. This fragmentation is a normal process in star-forming clouds. Massive stars – those at least 8 times the mass of our Sun – present an intriguing mystery: how do they grow so large when the vast majority of stars in the Milky Way are considerably smaller? To find the answer, astronomers used the Atacama Large Millimeter/submillimeter Array (ALMA) telescope to survey the cores of some of the darkest, coldest, and densest clouds in our Galaxy to search for the telltale signs of star formation. These objects, known as Infrared Dark Clouds, were observed approximately 10,000 light-years away in the direction of the constellations of Aquila and Scutum. Since these cloud cores are so massive and dense, gravity should have already overwhelmed their supporting gas pressure, allowing them to collapse to form new, Sun-mass stars. If a star had not yet begun to shine, that would be a hint that something extra was supporting the cloud. Average stars like our Sun begin life as dense, but relatively low-mass concentrations of hydrogen, helium, and other trace elements inside large molecular clouds. After the initial kernel emerges from the surrounding gas, material collapses under gravity into the central region in a relatively ordered fashion via a swirling accretion disk, where eventually planets can form. After enough mass accumulates, nuclear fusion begins at the core and a star is born. The key to teasing out the answer is to find examples of massive starless cores – to witness the very beginnings of massive star birth. The team of astronomers from the United States, the United Kingdom, and Italy used ALMA to look inside these cores for a unique chemical signature involving the isotope deuterium to essentially take the temperatures of these clouds to see if stars had formed. Deuterium is important because it tends to bond with certain molecules in cold conditions. Once stars turn on and heat the surrounding gas, the deuterium is quickly lost and replaced with the more common isotope of hydrogen. The ALMA observations detected copious amounts of deuterium, suggesting that the cloud is cold and starless. This would indicate that some counter force is forestalling core collapse and buying enough time to form a massive star. The researchers speculate that strong magnetic fields may be propping up the cloud, preventing it from collapsing quickly. “These new ALMA observations reveal objects that are quite similar to the nurseries of Sun-like stars, but simply scaled-up by tens or a hundred times. This may mean that nature is more important than nurture when it comes to determining a star’s size," concludes Tan. These observations were conducted during ALMA’s early science campaign. Future studies with ALMA’s full array of 66 antennas will uncover even more details about these star-forming regions. 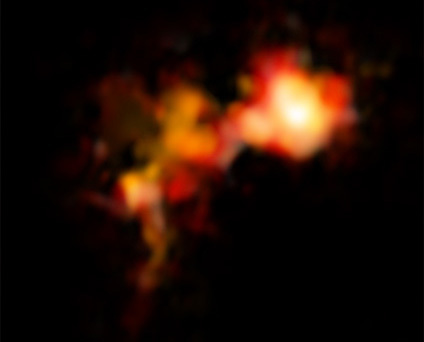 This image from ALMA shows two main cores as imaged by emission from the molecular ion N2D+ (two nitrogen and one deuterium atom). The core on the right is particularly bright and rounded, suggesting it is self-gravitating and poised to form a massive, single star – a very rare occurrence in star formation. The other core appears more distorted and fragmented, potentially leading to the formation of multiple lower-mass stars. This fragmentation is a normal process in star-forming clouds.